Learn 3 fantastic rhythm exercises that you can use with your students, taken from my brand new book, Rhythm in 5. These rhythm games are all really fun and take just a few minutes of lesson time – so what are you waiting for? Hey there wonderful you! My brand new book rhythm in five is out on Amazon and all those sorts of places Kindle and anywhere else you read the books. It’s out now and what I want to do on today’s episode is share three of the activities that are in this book. But first let me just explain to you what this book is about and what it’s for. So I created this book because most of us want to teach rhythm better. I see a lot of posts about this. We are frustrated by our students with poor rhythm skills or who are not paying attention to rhythm not counting not able to stay with the metronome. All these sorts of issues and they all come back to the fact that this rhythmic foundation maybe hasn’t been laid. Perhaps that student hasn’t got extremely musical parents at home. Perhaps they just don’t listen to a ton of music or maybe they just naturally don’t feel rhythm as easily as another student. As we talked about in last week’s episode and when we have students like this and music is not really being taught in schools perhaps it is perhaps it isn’t but it’s very hit or miss in most parts of the world where those schools are really teaching these skills too. It’s all left up to us. So what ends up happening is we skip over some stuff because we can’t teach everything in 30 to an hour 30 minutes to an hour a week. So we don’t lay this foundation that we kind of know we need but we kind of avoid thinking about because there’s just no way to fit it in. And so I wanted something where I could do just a few minutes of rhythm work in each lesson. I started doing this in my buddy lessons which is where my students come for some time just one on one with me and some overlapping time and in the overlapping time I started this year doing rhythm work first each and every session. And it’s made a real difference and I’ve really enjoyed working on it but I was using the rhythm activities that I already knew or had come up with myself. And coming up with new ones sort of on the fly or in advance of a lesson based on what my students needed to work on and the more I did this the more I realized that it would be handier for me and for all of you if this were laid out in a book or a course. So I decided to do both. So the book is called rhythm and five the course is also called rhythm and five and it’s available inside vibrant music teaching the book a printable version of the book that’s the A4 version is available free to vibrant music teaching members of your member and you haven’t checked it out. You can go get that now and anyone can buy the hard copy or the Kindle version of the book the e-book version I should say because it’s available on more formats than just Kindle. Anyone can buy that but if you want the course the printable version of the book that’s inside vibrant music teaching. So what rhythm in 5 is, it’s a set of 25 different rhythm activities all of which can be done with minimal equipment or sort of other resources. I’ve kept that to a minimum. It just uses three different things which are the rhythm vocab cards the relative rhythm cards and the jumbo note values all of these are inside VMT but they’re also available to anyone who purchases the book. So you don’t need anything that you won’t have. So that’s all that’s used for the basic exercises. And then from there I give sort of extensions of those exercises. So what more ways to move to them because they’re all sort of based on movement body progression that sort of thing. So more ways to expand them from there. I also give suggestions for instrumentation and experiments meaning how you can apply to your instrument how you can improvise with it what you can do with rhythm instruments that kind of stuff and what’s most applicable to that exercise. And then I give next level. So how to take it up a notch. So with all those different suggestions these exercises can be used with any level of student and I literally mean any we’re talking about ways to teach two against three that can be expanded to teach whatever combination of notes your student has in that grade seven Debussy piece or whatever. So they go all the way from the brand beginning students brand new students all the way up to advance students and each exercise can be used pretty much with every level of student with the adaptations I’ve given you there. So it’s super adaptable. It can be used by any music teacher so it’s not piano specific. I’m a piano teacher but this is not piano specific. Everyone needs to learn rhythm right. So I’ve given suggestions for any instrument and you can also use it as a vocal teacher of course and you can get it as I say on Amazon or inside VMT. So that’s why I wrote it and who is for. Now what I want to do today is share three of these activities from this book so you get a taste of what it’s all about. I’m going to actually read directly from the book so it’s a little bit of an unusual podcast and then I’ll chat a bit more about what they’re about. The first one I want to share with you is called swap swap swap swap. What are we learning here. Swaps are build an understanding of how a different note values relate to one another through this exercise. Students will gain confidence in feeling various note values in any temple. It’s also fantastic practice for a duet an ensemble work as they need to listen and tap at the same time. I won’t read all of those but you get the idea. If you’re working with multiple students you can include more than just two note values and create swap swap swap or a swap swap swap swap by rotating them around in a circle. More moves come up with as many different combinations of movements as you can try clapping patching stomping nodding jumping and touching your toes. You can even use simple dance steps such as a waltz step for a trailer against marching for a Ta instrumentation and experiments bring some rhythm instruments into swap swap and to practice in a new context. Take these rhythms onto your instrument and play any two complementary notes or chords while swapping rhythms back and forth. 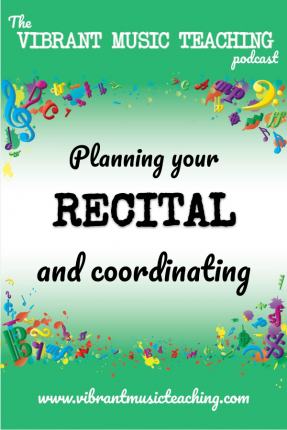 You could also extend this into improvised duets by combining an accompaniment pattern and a scale using the rhythms you’ve been practicing. Okay so I hope that was okay to follow along with. That’s what it actually says in the book. As I said I skipped out some of the examples of note combinations because I thought that might get a bit boring for you. So that swap swap and if it wasn’t quite clear of course you can get the full video with me explaining it and you can get the book so that the inside vibrant music teaching as well swap is one of the first if not the very first one of these that I sort of started doing at the start of lessons. And it’s what inspired this book. Over time it’s a very simple thing but it can be expanded to many different combinations of note values and it has made such a difference for my students understanding of simple things like a quaver half a Cratchit no matter what no matter what. Right. So no matter how slowly I do my task they have to fit t exactly halfway between. Some students take a while with this for sure and I do it in different combinations. So in my body lessons or even some lessons I have where I have a few siblings together for a certain amount of time just worked out different situations with big groups of siblings to give the parents a break. And in that case I might put two of them together and one with me as two teams which I mentioned briefly there. So for example I have the oldest student and the youngest student as a team and then I too I would team up with the middle student something like that so that everyone has someone who’s really strong on it and they can listen and learn and develop a sense of what it feels like to clap it in time without having to have all the responsibility of doing that especially if they’re on the younger side. But even young young students my 5 year old my 4 year olds can do this and they can do this independently with a little better practice. There is another exercise in the book called Switch switch which helps them prepare for this as well. But let’s move on to the next exercise. The next one I want to read to you is called Rhythm race rhythm race uses the rhythm vocab cards which many members will be familiar with and any purchaser of the book. Anyone who buys the book can grab those as well for free. So rhythm race what are we learning here. Being able to retain a rhythm pattern in the mind’s ear even for a moment is the first step towards transcribing rhythms and internalizing rhythm patterns. This fun game is a great way to work on aural memory and also get the wiggles out at the same time. The basics get your student to draw two rhythm vocab cards at random. You can use a particular selection of cards if you want to focus on certain note values. Say each rhythm together and then place the cards in different spots around the room. Clap one of the rhythms and ask your student to run to the one you clap. Get you student to draw two more rhythm vocab cards at random say them together and ask your student to choose two more spots for these. Now clap one of the four and ask your student to run to the one you clap. Repeat this a few times next levels. You can add more and more rhythm vocab cards to choose from. If four gets too easy build up to as many as you can and also try this with the next levels of rhythm vocab cards as they’re introduced. More moves draw pictures or ask your student to draw them of stick figures doing various different actions such as spinning around putting one hand in the air putting two hands in the air jumping dancing sitting on the floor kneeling hands on hips place a different rhythm vocab card under each one of the pictures. Now your student must do the matching action to identify which rhythm you clapped instrumentation and experiments rather than clapping the rhythm. Try playing it on your instrument. Start off just playing one repeated note and then introduce melodies. You might even be able to think of famous melodies that use some of the real patterns and play those. So this is another one of the ones that I came up with early in the journey of creating this book. So which is why I want to share it with you. It is fantastic whether you have just one student or many to have any excuse to get them up and running around a bit. I know you’ve all had that feeling where you like if they could just focus better. Well the thing is they would focus better if they got up and moved around for a minute and sat back down. So this is a great one to use as a brain break in the middle or as a way to transition from one activity to another in between practice run through is of a concert piece whatever you like. It’s a good way to just break away from the norm and then come back to it and it is obviously fantastic practice for identifying rhythms and therefore internalizing what they sound like and how they feel and how they look. So rhythm vocab cards if you’re not familiar are just small cards with what they’re not that small but smallish card with one bar of rhythm on each one. There are four levels of rhythm vocab cards and the first one is just for four and includes dotted crotches quavers quick crotch it rests crotches and quavers. I already said quavers you get the idea. So it’s limited to certain oh sorry Eminem’s is limited to a certain set of no values. Then the next level goes up does 3 4 and also includes semi quavers that sixteenth notes for those of you in the US. So they progressed in that way and they get gradually more complex including syncopation different time signatures that kind of stuff but each that stays in one time signatures so that they can be used beside each other. That’s really the way they’re meant to be used. So by placing these cards around the room and running to them your student is identifying the rhythm. Now we could have them just point but obviously running is better because it gets the wiggles out and it’s more beneficial for them in that way. We start with just two of the rhythm vocab cards so that they get used to the activity on subsequent tries of this. Like when you try it the next time you don’t need to do just two first and then add two more and you can do four straight away four is a manageable amount for most students. And then I would add more and more rhythm vocab cards or add I would start with four and then add another set of four and stay. See how they’re doing if they’re getting really good at identifying between those four. Also in the body lessons in particular when I have more than one student I would have one of the students clap the rhythm. So the first few times I would do it so they get how it works. Then I would have the student clap one of the rhythms for the other one to identify and swap roles and also have them play it on the piano rather than clapping it sometimes so that they get that it doesn’t matter what pitch it is the rhythm is still the same and they can get a bit creative with that as well and create their own little melody. So that’s rhythm race. Now the final one that I want to share with you is called Listening locomotive listening locomotive is actually the last one in the book. And although all of these exercises can be used with multiple levels of students I have put them in a rough order of difficulty for a brand new beginner. So while this isn’t difficult it’s on the more difficult end of the spectrum when it comes to the rhythm and five exercises. Listening locomotive what are we learning here. Listening locomotive helps students develop the skill of listening and playing at the same time which is an important and sometimes difficult skill to pick up. This is useful not just for playing with the other musicians but also to allow your student to really listen to their own playing. Plus they’ll need to develop a rock steady beat to get really good at this one. 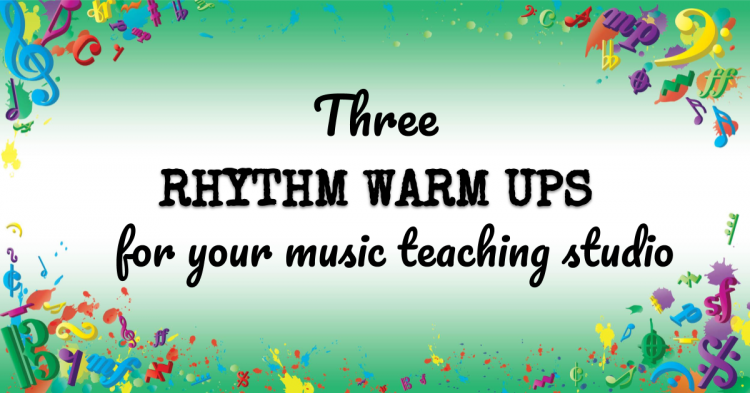 The basics start by clapping and saying rhythm pattern and ask your student to join in and say it with you when they’re ready. Stop the rhythm for a moment and explain that this time you’ll start with this rhythm and change to a new rhythm pattern. At some point they need to try and keep the first rhythm pattern going. While listening to your new pattern once they feel like they’ve got it they should change to the new one. Don’t worry if your students transition to the new rhythm isn’t very smooth when you first try this. Don’t stop to correct them. Just keep repeating the second rhythm until they catch on. Then change to a new pattern. Once they’re confident with it next levels this game will naturally get faster and faster as your student gets better at it. This keeps things interesting and keeps your student progressing nicely. You can incorporate new note values as they encounter them but don’t use this game to introduce a new note value. It’s much more fun and educational when your student knows the note values being used very well already more moves you can absolutely use movement. Other than clapping for listening locomotive but try to stick to ones that are not too loud so that your student can still hear them clearly patching or tapping two fingers on your palm would work well. Instrumentation and experiments. This is a fantastic and challenging game to play with scales or other technical exercises. Use one very simple rhythm pattern for the full scale or exercise demonstrate it for your student and then repeat it a few times together in this rhythm. Play the scale again but this time you should change your rhythm to a new pattern while they keep theirs the same. Then repeat the second rhythm with them now joining you in the new pattern. If they were listening well they should be able to play in time with you on the first try. If not just repeated a few times until they have the new rhythm then change it again. OK so I hope that one was clear. It’s a little bit confusing to explain. I think it’s clear in writing obviously and it’s even clearer in the video which is in the video course in VMT but to go over what I’m talking about there. I’m talking about you doing a rhythm and changing it to a new one while your student is doing the first one and then they need to copy yours. So without breaking the stream of the rhythm they’re doing they are trying to change to your new one so they have to listen and then switch over. So as I mentioned though this is great for scales. If you have them do a very simple rhythm like say deep deep tap or a quaver quaver Cratchit or a note a note quarter note blank there is again something simple simple simple like that. So you do that you do it together then they still do that one but you change yours perhaps just the reverse Ta Titi and they need to lesson 0 1 while they play the original one and then swap to your new one. So they’re gradually building up the skill of I keep mine going but I can listen to someone else’s. As I said this is the last exercise in the book for a reason. It’s not super hard but it does take a bit of practice and I wouldn’t use it with a brand new student although it’s certainly available to beginners it’s not like it’s an advanced exercise or anything like that. Every exercise can be adapted to every level. Okay I hope you enjoyed this slightly unusual episode where I read through bits of my book and that maybe it inspired you to go grab a copy or if you remember to jump over and check out the chorus and the book in the library next week. For the rest of you. I hope you go and grab that book and that you enjoy it and have some fun with it and you can let me know of course if you’ve any questions on today’s show notes page. That’s it for this week. I’ll chat you soon. Vibrant music teaching members can get the full rhythm and five course. And the printable version of the book Inside VMT. If you’re not a member yet you can sign up at VMT dot ninja today. The above audio transcript of “VMT 030 – 3 rhythm warmups for your music teaching studio_FULL.mp3” was transcribed by the best audio transcription service called Sonix. If you have to convert audio to text in 2019, then you should try Sonix. Transcribing audio files is painful. Sonix makes it fast, easy, and affordable. I love using Sonix to transcribe my audio files.